After an early career in post-production Jim Groom’s first feature-length directing stint was the low budget horror-comedy Revenge of Billy the Kid in 1992. This sick little tale about a half-man/half-goat creature going on a killing spree in the Westcountry became something of a cult hit on video, though it’s fair to say that it also repulsed a number of critics. Groom’s latest movie Room 36 has recently gone on theatrical release after over ten years in production. Let’s start off by talking about your first feature. Was it a difficult process to secure funding and distribution for Revenge of Billy the Kid? Oddly enough, the initial funding for Billy The Kid just fell into place, though prior scripts had been trapped in the usual funding nightmare. One in particular was a script we’d written called You’re Dead about an unbalanced young male mortuary attendant who falls in love with a young female corpse, steals it and takes it to London to co-habit ultimately leading to all manner of problems. It was a good script and there was some interest at Cannes but the budget, for first time film-makers, was just too high at £1.4m. We were going to re-package it with a lower budget in mind but stopped when we learnt that the script had been plagiarised and was being made into a film called Living Doll. After this experience we advertised for scripts and ended up reading dozens from all over the UK and some from abroad, including novels. Of these only two were worthy of pursuing but, for one reason or another, were unable to acquire the rights and opted to write another script, this time definitely in the ‘low-budget’ category. The result, Revenge of Billy The Kid. Before we had the chance to begin looking for industry funding, a sum of money fell into our laps from a property deal – bingo! It wasn’t a huge amount of money but enough, we thought, to do all the principal photography. We had our own cutting rooms and the idea was to present the edit to a distributor and a sale would pay for the final post-production. That would have been fine, except we went over schedule and over budget and returned to the cutting room with only enough footage for one hour. It seemed like a long shot but we advertised in Private Eye seeking finishing funds – and got them! We didn’t get all the money we were after but a large majority of it and we were back in business. As soon as we had our final sound mix and answer print we held a private screening in Wardour Street for a number of distributors. Shortly after we had three offers on the table. There was bitter disappointment when we learnt that the UK theatrical release was shelved and the film was put straight out on video with a large number of cuts totalling fourteen minutes and some poor colour grading. Still, the distributor had put a lot of money and effort into its publicity which paid off – Revenge of Billy The Kid went into 14th place in the UK Video Rental charts for 1992, above films such as Memphis Belle, Nuns On The Run and The Krays. What we didn’t know was that our investor with the finishing funds was about to slam the door on us and even to this day we have no idea of the total world-wide revenue that Revenge of Billy The Kid has earned. I hadn’t seen any of Peter Jackson’s films prior to filming Revenge of Billy The Kid. Thinking back, I can’t really say what my influences were. With the exception of I Bought A Vampire Motorcycle there were no British films in the same vein at that time. One had to look to the US where films like George A Romero’s Living Dead films and Sam Raimi’s Evil Dead were being made and these were certainly inspiring. I did see Bad Taste shortly after Billy was finished and was a little disappointed, but then saw Peter Jackson’s documentary on the making of it and really admired his determination and I see a lot of similarity between our films that way. 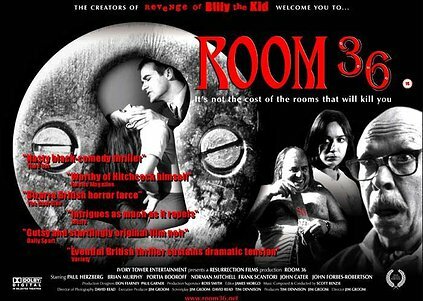 Room 36 arrives over 10 years after your first feature and I understand problems included the funding running out, the film stock being discontinued, the death of actor Norman Mitchell and the negative being damaged when the film lab went up in smoke. Were there times when you just wanted to give up on Room 36 or were you always optimistic it would get released in the end? I must admit, I did think of giving up on Room 36 many times but I knew that, if I did, I would not only be letting myself down but the film and all the cast and crew who had worked so hard on the film. There was one time though that I did give up but it was only temporary. That was in October 1994 when a rough cut, sans titles, opticals and finished soundtrack, was shown for the first time. The feedback was less than enthusiastic. I tried to assure people that when these elements were added all would be fine. However, I was in a minority and the general opinion was that the film should be cut down being, as it were, ‘padded’. The running time then was 84 minutes and I managed to cut it down to 80 but refused to go further as it would no longer be of feature length. The overwhelming opinion, however, was that it still needed further editing and I took the decision to walk away from the project rather than see it hacked to pieces and end up as a one hour programme on late night TV. I was optimistic and very determined that Room 36 be released as a feature length film but lacked the finance for more filming and the final post-production. It was at this stage that I parted amicably with the producer, Tim Dennison, and looked to other projects, one of these being the taking over and running of a preview theatre in West London. A few years later I was approached by Frank Scantori, the actor who plays the larger than life character Richard Armstrong and who was one of the original investors in the film. He asked me what was happening with the film and whether he would see his money back. I promised to see what could be done. I regained the film and all its elements from Tim and ran the 60 minute version in a preview theatre accompanied by the director Tony Kaye, whom I had worked with in the late 80’s as his film editor. Tony really enjoyed watching it, especially the scenes with Frank, and was very encouraging. It was at this point I decided to put my resources, albeit somewhat meagre, into finishing the film. Mind you, if I had known what lay in store, I’d still be running the preview theatre today. Has the long process of getting Room 36 completed and released discouraged you from the movie-making process at all? No, far from it. For me, there is one very satisfying element to the whole film-making process and that has nothing to do with the making of. To me, it is watching the reaction from an audience and, like it was with Revenge of Billy The Kid, the reaction to Room 36 has been very mixed and very dramatic. I’ve no doubt that there will be all manner of issues to deal with on the next film, hopefully nowhere near those we experienced on Room 36, but I’m really looking forward to rolling up my sleeves and getting on with it. So what’s the response been like in general to the finished movie? Very, very similar to Revenge of Billy The Kid. It’s uncanny really. The audiences either love it or hate it and that seems to be split 50/50. Obviously, I’d rather those that love it be in the majority but I’m very pleased to say that it seems nobody has the opinion of Room 36 being just ‘okay’. If that were the case I think I would give up. Where’s the satisfaction in making just an okay movie?! Room 36 combines a dark, violent plotline with a population of grotesque characters and a large dose of black comedy. Do you think humour’s an important tool in making a story even more disturbing? You were line-producer on the horror movie Beyond Bedlam starring Elizabeth Hurley. How was that experience? What did you think of the finished movie? Working as a line-producer on Beyond Bedlam was hard work, as all film-making normally is, but was a good and enjoyable experience. Although considered a low budget film it was great to see all the trimmings that I had lacked on Revenge of Billy The Kid and Room 36. By that I mean a full crew, the latest equipment, good transport facilities, assistant directors and, most importantly, catering. Unfortunately, I was disappointed with the finished result but, to be fair, the project had undergone last minute pre-production problems with the original director walking, script changes, that sort of thing. What’s your opinion of the British film industry in general? Without proper knowledge of other countries’ film industries I’m not sure that ours is all that different, except to say, on a smaller scale than most. Whereas we used to lead the way when it came to film-making it seems now we are just happy to provide a service to overseas film-makers and that is depressing. There seems to be a sense of complacency in the British film industry. Why bother trying to make our own films when we can just sit back and make, post-produce or acquire the films from those with the money. I have a major problem with what people consider as a ‘British’ film these days. It seems a lot of people are happy to think that some of the big blockbusters are British. Why, because they were filmed here, using a British crew?! For the British film industry to thrive – perhaps, even survive – what’s needed, in my opinion, is a dominant chain of British cinemas that can keep the box office takings here within these shores and be re-invested in British films. But they have to be commercial and able to turn a profit, something the British seem to be very timid about. I’ve heard your next film goes by the name of Zombie God Squad. Can you tell us a little more about the movie and do you think it’s going to be 2017 before we see the movie completed? With recent events, Zombie God Squad may not be my next film to go into production as we have had the wonderful actor Malcolm McDowell agree to star in a siege-thriller of ours called Blind Justice. It is destined to be shot later this year in and around the Rocky Mountains of Canada. I am certainly looking forward to making Zombie God Squad which is one of my favourites and a return to the very quirky and zany style of Revenge of Billy The Kid. It was written for Troma almost straight after we had completed Billy The Kid. When it finally gets made you’ll see in the film our homage to Troma in a variety of ways. Our inspiration for Zombie God Squad came from the film Psychomania in which a motorcycle gang discover that they can achieve immortality by the act of suicide just so long as they firmly believe it. In our film, members of the Salvation Army become victims of a murderous motorcycle gang and it is they who achieve immortality and go on a holy clean up mission for God, all with tongue very firmly in cheek you understand. Will it be ready by 2017? Long before then – I hope! What advice do you have for any inspiring film-makers desperate to put together their first feature film? Have wealth! A wealth of patience. That’s what’s required and a dogged determination to believe in yourself and your project. There are many people out there who scorn upon new talent but occasionally – just occasionally – you can find individuals or companies that are willing to assist those in need and that is what should motivate and keep new film-makers going, though I can assure them that the road getting there will be a very long and extremely bumpy one. Yes, trying to make a niche, or even just a basic living in this business, has been traumatic, stressful, sometimes even unbearable, but, with all that said and done, I’d do it all over again. It’s a blast.